Ready for travel! The amazing Oyster2 might be the perfect stroller, since it reclines fully so it meets all requirements for a newborn to be strolled comfortably. And since this travel system includes the CYBEX Aton Q car seat, you can rest assured that your little one is in for a treat! The fashionable Babystyle Oyster 2 pushchair combines innovative design and style and is suitable from birth. Designed on a stunning mirrored chassis it has been finished with smart tan leatherette trim on the handle and bumper bar. Favoured by hundreds of new parents in the United Kingdom and now in Cyprus, Oyster2 is the ideal choice for new parents looking for a value for money baby pram with style and high functionality. With multiple awards under it's belt and countless amazing reviews, this fashionable infant travel system is a sure bet for first time parents and expecting families. Aton Q continues the success story of the award-winning Aton family in Gr. 0+ and scores an excellent 1.6 (good) at German consumer testing organization Stiftung Warentest (Test 06/2014). 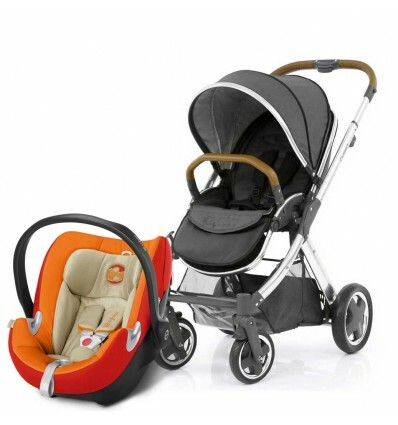 *Price Includes Colour Pack & Free Adaptors when purchased with car seat. 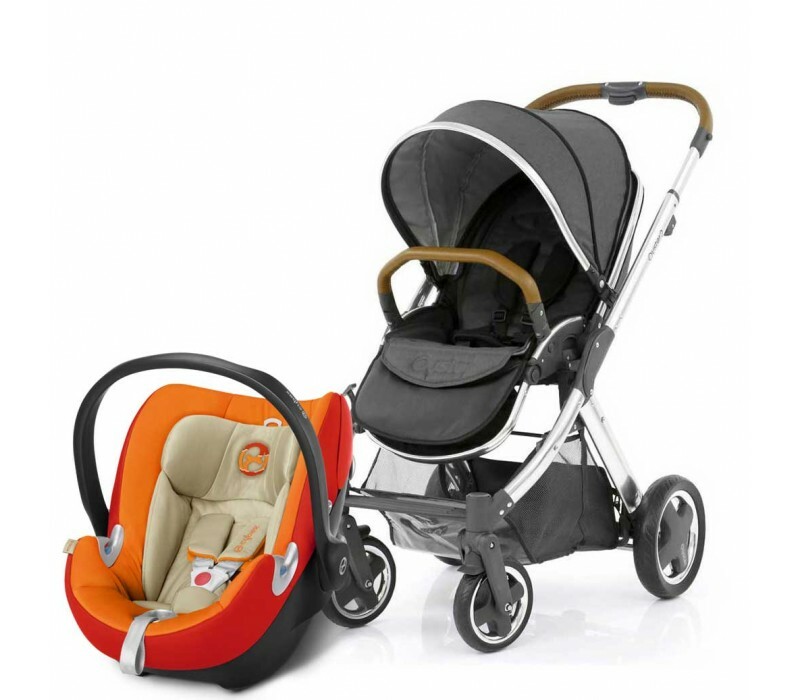 A range of accessories are available separately including matching carrycot, car seat, footmuff/summer liner and changing bag. The eye-catching Oyster 2 pushchair features a lie flat, forward or parent-facing seat unit that is suitable for use from birth and has been designed on a lightweight, compact chassis making the Oyster 2 easier to get in and out of doorways while still offering a full width seat. The pushchair has swivelling front wheels for easy manoeuvrabilty which can be locked into a fixed position for easier steering when travelling over bumpy surfaces and the independent cantilever suspension on all the wheels will ensure travelling up and down kerbs are easier and that baby enjoys a comfortable ride. For ease when storing the quick release wheels will make the pushchair even more compact. The Oyster 2 comes complete with a generous shopping basket plus an integrated insect net and can also be customised with a range of accessories that are available separately including a carrycot to make a lie-flat pram for your newborn and will transform into a travel system by adding one of the compatible baby car seats. Your Options do not end with the chassis and leather colour details. All Oyster2 bought from Mari Kali are offered with the colour pack of your choice. See all the gorgeous colours below. BabyStyle offers an array of accessories made exclusively for Oyster2 and Oyster Max. From Cup Holders, to Ride on Boards for toddlers and the new, amazing Rockit Portable Stroller Rocker. Aton Q continues the success story of the award-winning Aton family in Gr. 0+ and scores an excellent 1.6 (good) at German consumer testing organization Stiftung Warentest (Test 06/2014). The ADAC rates "good". The ÖAMTC rates "good" with a historic top grade for its excellent side-impact protection when installed with the ISOFIX base. In the categories safety and harmful substances it received a “very good”. The interaction of a clever telescopic Linear Side-impact Protection (L.S.P. System) and a height-adjustable headrest with an integrated harness guide ensures the highest level of safety and comfort. In addition a new function enabling the flattest possible lying angle between head, neck and chest reduces the risk of breathing difficulties for premature babies and very small newborns. A matching XXL fold-away sun canopy with UPF50+ perfectly protects against high sun radiation and strong wind. The telescopic Linear Side-impact Protection (L.S.P. System) absorbs the force of a side-impact collision in combination with the energy absorbing shell. The telescopic Linear Side-impact Protection can be easily and individually adjusted. The very first forces of an accident are transferred by the extended side protector facing the door and are distributed to the car seat's shell. The flexible material and structure of the infant car seat then absorbs the forces of an impact and channels them away from the baby. For maximum protection of baby's skin, the matching XXL fold-away sun canopy fulfils the stringent, Australian UPF50+ sun protection standard. The integrated, extra-large sun canopy disappears elegantly behind a colour-coordinated visor. It can be extended incrementally, offering not only perfect sun protection but also protection against wind and rain. In combination with the telescopic Linear Side-impact Protection System the height-adjustable headrest adds to the excellent side-impact protection of the Aton Q infant car seat. With the new 8-position height-adjustable headrest with integrated harness guide, the length of the harness changes automatically when the headrest is adjusted. This prevents any need for the difficult threading in and out of the harness and makes it almost impossible to misuse. Using a simple adapter, the Aton Q infant car seat can be effortlessly converted into a travel system with strollers and buggies from CYBEX, gb and other selected brands. The design DNA of the Aton Q car seat extends across all PLATINUM products and is also present in the CYBEX buggies. With the help of simple adapters, the infant car seat, together with the CYBEX buggies Callisto, Topaz and Onyx turns into a clever, visually harmonious travel system. The Aton Q can also be combined with many other-brand prams and buggies to form a practical travel system. Continuing the CYBEX tradition of having fashionable colours, the PLATINUM car seats come in a great range of colours in two fabric variations. Comfort version: the soft and cozy comfort version of the Platinum car seats features 3 colour combinations. Plus version: the Plus version gets its characteristic appearance through an exclusive, very hard-wearing fabric with a twill effect in a denim look. These child car seats are available in 4 different colours.